This printed cotton twill was my immediate first choice fabric at Toraya Shoten. I purchased enough to make a jacket or a jumpsuit. Wherever in the world I go, I absolutley must check out the fabric store. I always take a lot of notes, because every store is different. 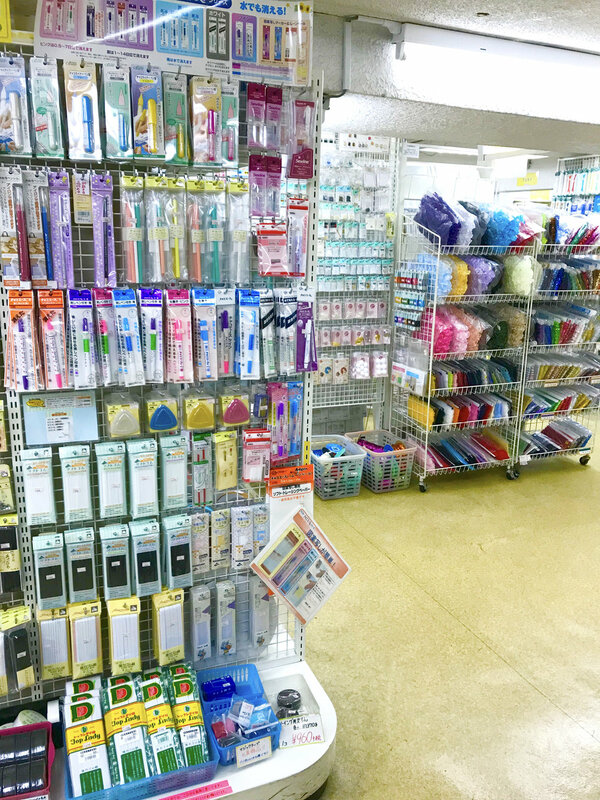 I haven’t seen a ton of foreign fabric store reviews online, but I always google “[name of city I am visiting] fabric store” before traveling anywhere, so I want to start sharing my reviews with you here. Toraya Shoten in Osaka is a unique shop, quite different from any other fabric shop I have visited, and I loved everything about it. You can’t miss the store if you are looking for it. Here you can see how it spills out into the shopping arcade. There are lots of remnants and precuts out front to draw you in. Toraya Shoten is located near not-to-be-missed Namba, so if you are visiting Osaka, you are likely to be near this store at some point, and it is worth taking some time to seek it out. The store spills out into a (pedestrian only) shopping street, and out front and in several stations inside the store there are remnants. Small cuts up to 2 meters or so of all kinds of fabrics are on display, priced individually. One of the aisles on the first floor of Toraya Shoten. The store has 3 floors, accessible only by stairs. Most “everyday” fabrics are on the ground floor. Things get fancier on the 2nd floor. 3rd floor is incredibly well stocked with all manner of haberdashery, notions, and patterns (garments, bags, baby, novelty items such as stuffed animals). If you want to buy something on the 3rd floor, you pay on that floor. Difficult choice, but I went with the darker blue. This is a bottom weight 100% cotton printed plaid - won’t it be fun with a woven gingham top? This store is set up unlike any other fabric store I have been to. All fabrics are displayed in neatly folded cuts, all colorways of each fabric/print displayed together which is great. The store is logically organized and densely merchandised! There are little signs everywhere telling you info about each fabric. This is part of their 100% cotton woven gingham fabric selection. From 1/8” to 1.5” plaid, all sizes are available in the full range of colors, ideal for mixing scales and having the color match. In addition to fabric store staples, they have wool knits, printed & solid linens, many velvets, a gingham selection that blew my mind (color and scale variety like whoa! ), tons of pre-quilted fabric (seems very popular in Japan), the kind of bathrobe appropriate French terry you can never find in the USA (in a range of colors), lots of printed & solid chirimen (the crepe textured woven fabric often used in kimono and Japanese bags and crafts). 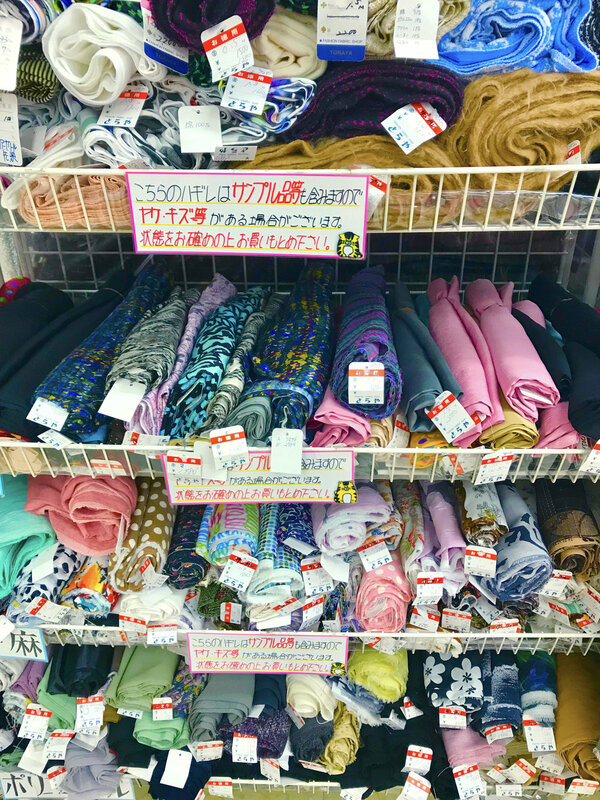 They have all those lovely “made in Japan” printed cottons and linens that you see sold online and in cool sewing shops in the USA, for about $5-8 per meter. They also have a lot of “made in Japan” fabrics that are....let’s say *very inspired by* Liberty and Marimekko. One thing to note is that most of the Made in Japan fabrics are around 42-44” in width, regardless of fiber content/weave. My receipts. I love that I can see how many yards and the price. I will keep these with the cuts in my stash for easy reference. When you want a fabric cut, find an employee (they won’t be far or hard to find). They will write you a ticket, and keep a carbon copy of it. They cut 2 small swatches of the fabric you want (1” square) and staple one to each ticket. Then you wait about 10 minutes. There is a desk at the front of the shop where the fabric is delivered via a tube...like the tubes they used to have at the drive up bank. You show your ticket and pay. With no bolts and no cutting table, the store is very tidy. One of the remnant areas on the 2nd floor. All cuts say how many meters, the fabric width, and price. Overall, the fabric prices are great, lower than you would see for these fabrics in the USA (or at least in New York). The employees are very polite and helpful. They wait for you to request help. No one spoke English, but this was not an issue. Everything is clearly labeled with a price. When having elastic cut on the 3rd floor, there was some confusion about how much I wanted, but we sorted it out easily by looking at a meterstick together. I usually prefer shopping on bolts, but I really liked this set up. It is visually overwhelming, because you can see everything at once - you may love or hate that. The store is on a small footprint, but they have fully maximized how much can be on display. The bottom weight 100% cotton selection was incredible! I usually never have this sort of thing in my stash, and I just started sewing myself pants, so I stocked up. View from inside the store, looking out into the shopping street. If you happen to be traveling or shopping with someone who thinks fabric stores are a snooze, no problem! Toraya Shoten is surrounded by many totally unrelated shops, as well as many street food stalls, a specialty of Osaka. If you look closely at the above photo, you can spot the pork buns shop across the way. They’re delicious! The top floor of the shop is haberdashery and trims. There is a large selection of iron on patches, bag making hardware and tools, sewing patterns, so many Clover brand notions, everything you need to complete pretty much any project. If this was my local shop, I would be very happy!